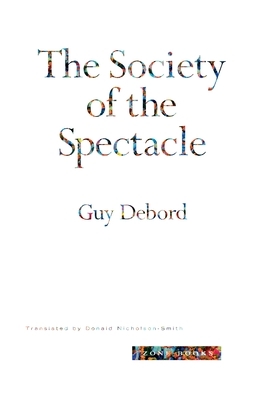 For the first time, Guy Debord's pivotal work Society of the Spectacle appears in a definitive and authoritative English translation. Originally published in France in 1967, Society of the Spectacle offered a set of radically new propositions about the nature of contemporary capitalism and modern culture. At the same time it was one of the most influential theoretical works for a wide range of political and revolutionary practice in the 1960s. Today, Debord's work continues to be in the forefront of debates about the fate of consumer society and the operation of modern social power. In a sweeping revision of Marxist categories, the notion of the spectacle takes the problem of the commodity from the sphere of economics to a point at which the commodity as an image dominates not only economic exchange but the primary communicative and symbolic activity of all modern societies. Guy Debord was one of the most important participants in the activities associated with the Situationist International in the 1960s. Also an artist and filmmaker, he is the author of Memoires and Commentaires sur la soci t du spectacle. A Swerve Edition, distributed for Zone Books.